To see the 'Time Sheet Attendance Report', go to the tab 'Reports' -> 'Time Sheets' -> 'Time Sheet Attendance'. 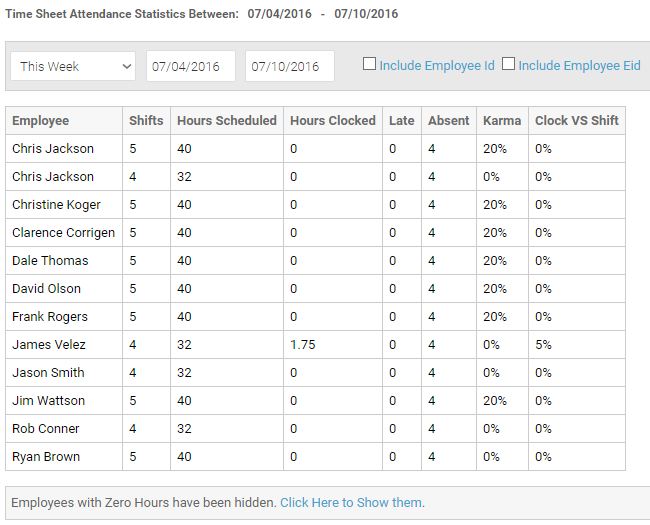 This report compares the Scheduled Shift times against Clocked Hours to calculate the attendance score. Also shown is the 'Clock VS Shift' percentage which shows you the percentage of their clock-in and out times against their actual scheduled shift times. 'Karma' is essentially a percentage score of their 'Late', 'Overtime' and 'Absences'.